Excellent analysis! People like Jim “the Gospel is all about wealth redistribution” Wallis get away with that all the time with their politics-disguised-as-religion approach. They disingenuously have (admittedly clever) slogans like “God is not a Republican . . . or a Democrat” then go on to support the extreme wing of the Democratic party. 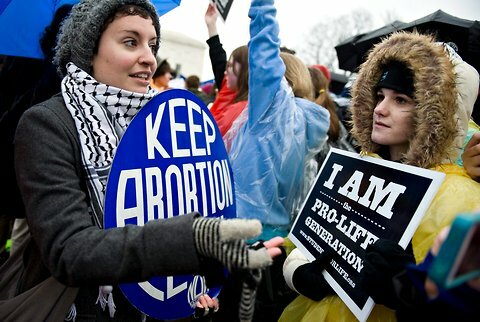 They prattle endlessly on a vaguely defined “social justice” yet are silent on abortion — or worse yet, secretly support taxpayer-funded abortions. BTW, whenever someone brings up Fred Phelps as if he is on our side, remind them that Fred is a Democrat — http://tinyurl.com/28t2ug4 . Well said! It was not the religious right that made abortion a political sacrament, welfare a political slavery and morality a political satire. Especially the ridiculous way Perkins handled that whole Values Voter Summit this year — touting how important it was beforehand then immediately backtracking as soon as his ‘anointed’ neo-con didn’t win. Which leads me to my own reason for moving past the religious right: I’m tired of being duped by the party of ‘bombs and babies’. Don’t get me wrong, I love babies. I’m one of those crazies that spends his saturday mornings counseling on the sidewalks in front of abortion clinics. I’m just tired of being told the only way to protect my unborn brothers and sisters is to vote for the only neo-con the GOP puts forward — and somehow look past the fact that in all our “moral imperatives” to export freedom to other countries in the world, we’ve taken alway the foundational freedom in our own: life itself. I don’t buy the mythical Supreme Court pipe dream that guys like Karl Rove have been feeding us, and I’m not willing to wait through another 30 years of compromising “prolife” candidates to “maybe” “one day” “hopefully” get enough appointments to the Court to slap down Roe v. Wade. One of “those” Ron Paul guys who love Jesus, are sold out to defending the Unborn, and actually still believe in the Just War Theory. Brother Hank, I think that you make some very good points. I am 100% pro-life, but I also reject the neo-cons and their foreign policy ideas. I make yearly monetary donations to the IRD, but the thought of reconsidering this has occurred to me because of what I see as a neo-con influence at the IRD. I have also done volunteer work for GOP candidates and it didn’t take me long to realize that they want our votes, money, and volunteer time but very few have any intention of giving us anything back in return. Mike, I feel your pain. The problem is that we are in the midst of a culture and spiritual war right now and can’t get too confused. Keep your focus on doing the right thing and place energy where most effect can be made. Oh, and pray like hell. @ Bro Hank. AMEN. after 32 straight years of voting straight GOP tickets, I gave up and when Paul in 2008. I’ll do it again this year too. I refuse to hold my nose and compromise any longer. If that makes the GOP go the way of the Whigs, then good riddance. @ Pudentiana: Bro Hank and I are not at all confused. Actually, we’ve awoken from the koolaid induced slumber and refuse to be GOP patsies anymore. Our guiding principles, like Rep Paul’s are found in Bible and Constitution, not GOP platforms or candidates’ empty promises. GOP may die, America may fail, but God goes on forever. So will we. And, thx – but I’ll pray like HEAVEN. I am disappointed that our representatives are not courageous enough to stand on Biblical principles no matter what party they belong to. Anytime legislation is being considered we must first of all see how it lines up with God’s word. Sanctity of life and preservation of marriage and family are not negotiable issues. Our representatives will never please all the people all the time so they should at least be honoring God in their decisions. Of course, that is assuming that they know God. If they don’t, we should not expect anything different than what we are getting. If young evangelicals don’t know we are in a culture war, then it must be easy for them to jump sides according to how they feel when they get up in the morning or according to what is the popular opinion. Sweetheart, someday when true religious persecution comes to America because God has lifted His mantle of protection on this country and judgement has come, where will you stand? Beryl Moon…God has a protective mantle on America? …Really? !